It is even more significant after coming from our last church, where the staff children were to "be seen and not be heard”. Where our daughters and women in general were not given a voice or were barely allowed upfront. It is refreshing to be in a place where our daughters are highly involved and are welcome to serve along side of their fathers. 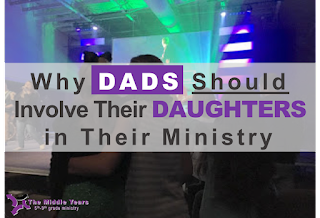 Involving your daughters as a “Ministry Dad" in our ministry, church, and life is important. Not to demand it, but to welcome it, embrace it, and truly celebrate it! Especially in the middle of the current national conversation, media, and movements about girls and woman being valued and respected! 10. They will learn they have a voice in the church and in our world. 8. They will see examples of Godly woman, first hand, empowering them to make wise choices about the women they want to become and the kinds of female role-models they choice to follow. 7. They learn how to be “help-mates" and Biblical partners in ministry. They can see your wife and her role in your ministry. 6. They will learn how to serve and experience the value of using their gifts and talents for God. 5. They will be given a safe place to talk and wrestle with what it means to be a "woman" and a safe place to grow into being a woman. 4. They can become a role model and encouragement for younger girls in the church but especially for other daughters on staff. 3. Because being a PK, is not easy. There is a lot of people that your daughter has to share you with sometimes. There is extra demands, weird schedules, and life interruptions. Involving them allows them to "own" it and appreciate it. It is not just dad's ministry, it is "mine"... "ours". 2. So they will be less likely to walk away from faith, church, God and maybe even you when they get older. There is no guarantees, but involvement is one more way to allow faith to become "sticky". Taking it from being "dad's church"..."dad's job"..."dad's faith" to "my church"..."my ministry"..."my faith"! 1. They are a daughter of the King and they are your daughter too. You get to share them! They deserve VIP, full access passes to us, church and to God. They should have the privilege to the front row seats and the backstage pass.